My late grandfather believed in no such notion as ‘postmodernism’. An inherent modernist to the core, however, he loved modern art greatly and Henri Matisse was prime example. It is thus that my appreciation for the Matisse canon was instilled at an age when I was still too young to know what the word ‘art’ meant (not that that’s changed very much), only that I knew that it was expressive beyond words and made me feel strongly. And today, a strongly rooted fondness for artists working around the latter half of the nineteenth century and into the first half of the twentieth is undeniable. With the period’s rich array of history and thinkers, the creative palette of Art Nouveau, Fauvism, Cubism, Impressionism and Realism doesn’t fall short of talent. It is therefore in great anticipation that I await to view the Royal Academy of Arts’ landmark exhibition, ‘From Russia’, presenting modern masterpieces by Russian and French artists working between 1870 and 1925. Over 120 paintings in total have been brought in from Russia’s principal collections at the Pushkin State Museum of Fine Art, the State Tretyakov Gallery in Moscow, the State Hermitage Museum, as well as the State Russian Museum in St. Petersburg. Part of what makes this exhibition so impacting in the art world is that it is the first time for these works to be gathered for a single show: Renoir, Cézanne, Van Gogh, Picasso, Gauguin and Matisse together side by side with Kandinsky, Tatlin and Malevich. It is without a doubt a unique opportunity to explore the symbiosis that existed between French and Russian art during times of upheaval and revolution. Another reason for the hype surrounding ‘From Russia’ is due to the possibility of claims being made on the paintings by descendants of the original owners. In order to allow the Russians to rest more at ease, Britain pushed through legislation to protect them from seizure. Chief curator of the show, Norman Rosenthal, describes the last month and a half as having been an uncertain time for the show coming together at the Royal Academy. ‘It is a testament to the good relations between the four great State museums in Russia and the Royal Academy,’ he says (BBC News). Some of the paintings have never before been seen in the West, many of which are being shown in the UK for the first time. 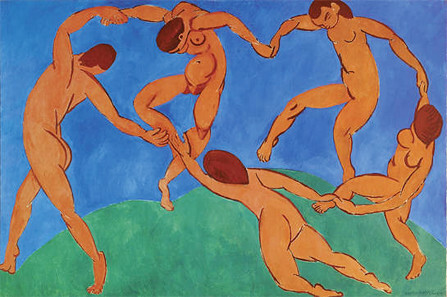 With Matisse’s The Dance being the centrepiece (his second version; the first is over at New York’s Museum of Modern Art), the four sections of the exhibit are comprised as follows: RepinFrench and Russian realists, the Shchukin and Morozov Moscow collections, BakstDiaghilev and the World of Art movement, and Petrov VodkinModernism. The exhibition will come to London from Russia via the Museum Kunst Palast in Dusseldorf where it will be displayed for four months–both showings sponsored by the UK’s largest integrated power and gas company, E.ON. From Russia: French and Russian Master Paintings 1870-1925 from Moscow and St Petersburg runs from 26 January to 18 April. Click here for ticket reservations.